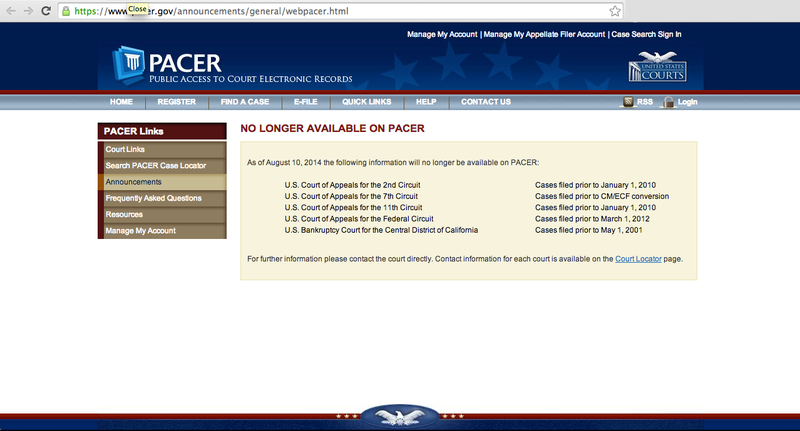 CourtListener and Juriscraper Now Support All State Courts of Last Resort! In 2010, we wrote our first scraper. It was a nasty affair that could do nothing more than download PDFs from a webpage — any webpage. Since that point, we’ve come a long way and today we’re extremely excited to announce that the Juriscraper library now supports every state court of last resort. In most states this is the “Supreme Court”, though some states call their highest court the “Court of Appeals” or similar. This means that no matter what jurisdiction interests you, no matter what area of the law you work in, you can follow the works of your state’s highest court in real time, getting emails or RSS feeds of the latest cases that interest you. And, of course, as new opinions are issued by these courts, we will keep adding them to our system, continuing to build the biggest repository of cases we can. As of today, Juriscraper has collected more than 400,000 opinions, and we expect that number to grow and grow. Jake Heller, CEO of CaseText, whose team there has frequently been a helpful sounding board when Mike and I are thinking through the interesting questions that arise when trying to put useful legal research tools on the web. Colin Starger, of the University of Baltimore School of Law, with whom we’ve had great conversations about citations, metadata, and bulk downloads, not topics of conversation that everyone has as much experience with as Colin! We’re happy to share today that we’ve completed a revamp of the CourtListener website to make it more polished, easier to use and easier to learn. There are a handful of changes we’re really happy about and that we’ve wanted to do for a long time. First, of course, is our new homepage. The new homepage is designed to showcase our latest material, to make new opinions easy to find, and to better introduce CourtListener to new users. The most striking change in the homepage is that at its center it now has a huge search box where you can place queries, and if you’re an advanced user, you can press the “Advanced” button, and it will show you all of the search facets that we support, from Case Name to Citation Count. One of the goals of the CourtListener platform is to enable others to analyze judicial opinions. To that end we provide all of our data as bulk downloads and try to archive any opinion that a court publishes. We realize having an opinion in the system two times can be a bit confusing, but the reason this happens is because courts will sometimes make corrections to a slip opinion after its initial release. Sometimes the new version of the slip opinion will make note of the change, other times the court makes this change silently, perhaps hoping that the public either doesn’t notice or doesn’t care. The Law via the Internet (LVI) 2014 conference will be held this year September 30 - October 1 in Nairobi, Kenya. The theme will be “The Impact of open access to legal information: Bridging the gap between accessibility and usefulness.” The call for abstracts is now available from the LVI 2014 website. Today a group of non-proft public interest organizations have released updated Best-Practices Language for Making Government Data “License-Free.” Free Law Project is glad to sign on to their statement and to support the effort to assist government agencies in making clear that their data is free of copyright or contractual restrictions and can be re-used freely. The details can be found at http://theunitedstates.io/licensing/ See also Josh Tauberer’s blog post announcing this release. Free Law Project is proud to announce that it has been officially accepted as a member of the Free Access to Law Movement. FALM is a consortium of non-profit institutions dedicated to providing free and open access to the world’s law. Its members subscribe to the Declaration on Free Access to Law. We have been operating consistently with the principles laid out in the Declaration for some time. Finding ourselves in complete agreement with the Declaration on Free Access to Law, we are excited now to make it official and to formally join with our colleagues around the globe engaged in these endeavors. 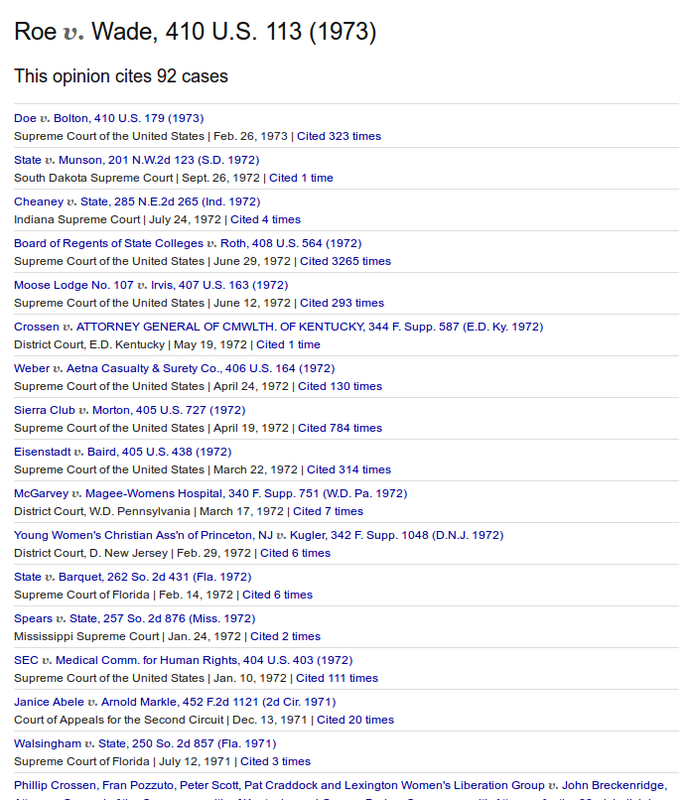 For a long time we’ve had a feature that allowed you to look at the items that cite an opinion, letting you to look into the future and see what cases found it important down the line. As of today, we’re announcing the complimentary feature that allows easy travel into the past. 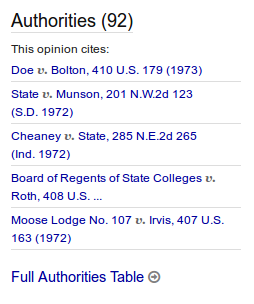 Starting immediately, when you look at almost any case in our collection you’ll see an Authorities section in its sidebar. Now, when you’re looking at an opinion, you can easily travel through time to either opinions that came later or ones that came before. Doc Brown would be proud. Today marks another big day for the Free Law Project. We’re happy to share that we’ve created the first ever API for U.S. Legal Opinions. An API —- or Application Programming Interface —- is a way for computers to talk to each other and consume each others’ data in an automated fashion. From this day forth, developers, researchers and legal startups can begin consuming the data that we have at CourtListener in a granular and very specific manner. Include a list of relevant opinions on your blog or website. Get a list of the new opinions of the day (here’s today’s, for example) and make a Twitter or Facebook page from it. Keep track of opinions that we’ve blocked from search engines at the request of an involved party. This might allow you to block such cases in your project or otherwise analyze privacy concerns in legal opinions. 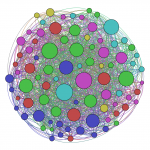 The citation graph is made into a network to compute CiteGeist scores. We’re excited to announce that beginning today our relevancy engine will provide significantly better results than it has in the past. Starting today, whenever you place a query we will analyze which opinions are the most cited, and we will use that to provide the best results possible. We’re calling this the CiteGeist score because it finds the spirit of your query (“Geist”) and gives you the best possible results. This is currently enabled for our corpus starting in the 1750’s up through about 1985, and the remaining years will get the CiteGeist treatment as well over the next few days. Want to Merge Millions of Legal Opinions? It Won’t Be Easy. Note: This is the third in the series of posts explaining the work that we did to release the data donation from Lawbox LLC. This is a very technical post exploring and documenting the process we use for extracting meta data and merging it with our current collection. If you’re not technically-inclined (or at least curious), you may want to scoot along. Working with legal data is hard. We all know that, but this post serves to document the many reasons why that’s the case and then delves deeply into the ways we dealt with the problems we encountered while importing the Lawbox donation. The data we received from Lawbox contains about 1.6M HTML files and we’ve spent the past several months working with them to extract good meta data and then merge it with our current corpus. This post is a long and technical one and below I’ve broken it into two sections explaining this process: Extraction and Merging. Note: This is a technical post exploring and documenting the work that was done in order to build our new jurisdiction picker. If you’re not technically-inclined (or at least curious), you may want to move along before getting sucked in. While prepping to import the Lawbox corpus, one of the many things we did was redesign our jurisdiction picker so it would support more than 350 jurisdictions. Completing this efort was a collaboration between me and a volunteer contributor, Peter Nguyen. 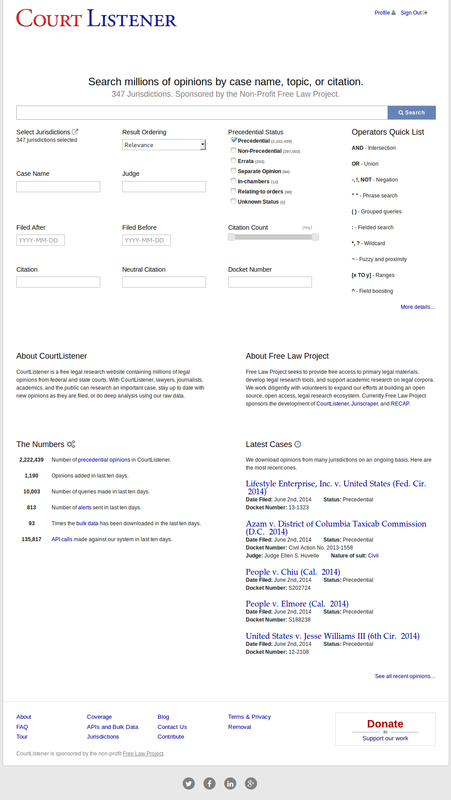 Peter and I worked together iteratively, first building a wireframe of the jurisdiction picker, then a prototype, then the final version that you see today. After many years of collecting and curating data, today CourtListener crossed some incredible boundaries. 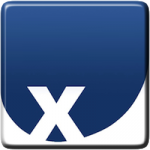 Thanks to a generous data donation from Lawbox LLC, our computers are currently adding more than 1.5M new opinions to CourtListener, expanding our coverage to a total of more than 350 jurisdictions. This new data enables legal professionals and researchers insight into data that has never before been available in bulk and greatly enhances the data we previously had. This data will be slowly rolling out in our front end, and will soon be available in bulk from our bulk downloads page. A new version of our coverage page was developed, and, as always, you can see our current coverage for any jurisdiction we support. For all of the new data and much of our old data, we have added star pagination throughout. 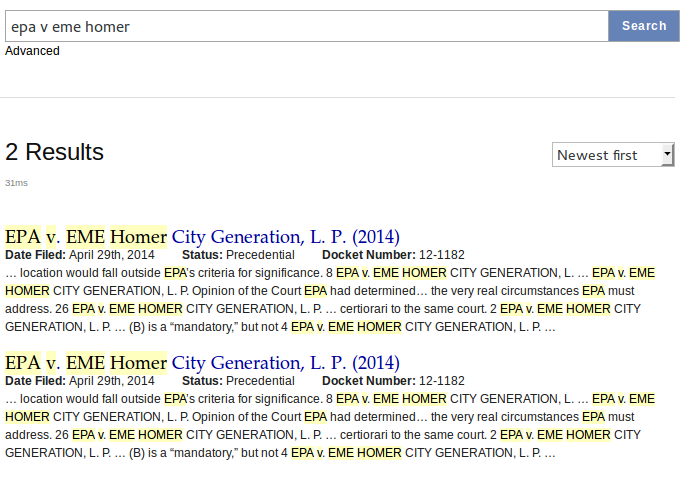 For the first time, this will make pinpoint citations possible using the CourtListener platform. Update: This tool has been deprecated. We heartily recommend our new process using Vagrant. A goal of the Free Law Project is to make development of legal tools as easy as possible. In that vein, we’re excited to share that as of today we’re officially taking the wraps off what we’re calling the Free Law Virtual Machine. For those not familiar with this, a virtual machine is a snapshot of a computer that can be run by anybody, anywhere. With this release, we’ve created a computer running Ubuntu Linux that our developers or academics can download, and which has all of the Free Law Project’s efforts pre-loaded and ready to go.